There was a time when most any meal I set out to cook began with a big glob of butter melting in a hot pan. Whether it was sautéing onions for a casserole, browning chicken for a braise, or scrambling an egg; it all started with butter. Then as I began reading about nutrition and becoming more conscious of my health, slowly but surely I transitioned to olive oil. Quietly and gradually, somewhere over the last few years, olive oil became my butter. Through most of my years of cooking, it was not unusual for me to use a pound of butter per week, or at least every couple of weeks. Nowadays it is a rare purchase indeed and though I still keep (un-salted) butter around for a special treat in a pan-sauce or on my Sunday morning toast…I can honestly say the transition is complete. And why not? Butter is a saturated fat too much of which can contribute to the build-up of blood cholesterol – Olive oil actually contains anti-oxidants and monounsaturated fats that have been proven to help lower cholesterol. Olive oil also contains vitamins E, K, and A, powerful anti-inflammatory properties and a host of other health benefits. So why eat butter at all? Well, aside from that wonderful flavor there are a few good things about butter. For one, it does not contain any trans-fat, it also contains beneficial vitamins and minerals, can be high in Omega 3, and can even help your body fight off cancer cells. There is a great article at getmybodyback.com that discusses the details. To my thinking these days, a little butter goes a long way…It’s a good fit in my “everything in moderation” theory that I mention so often. Butter is not inherently evil but it can easily be too much of a good thing. If you balance it out with a good bit of olive oil though, I think you can find a happy medium that will help you live a longer and more enjoyable life. 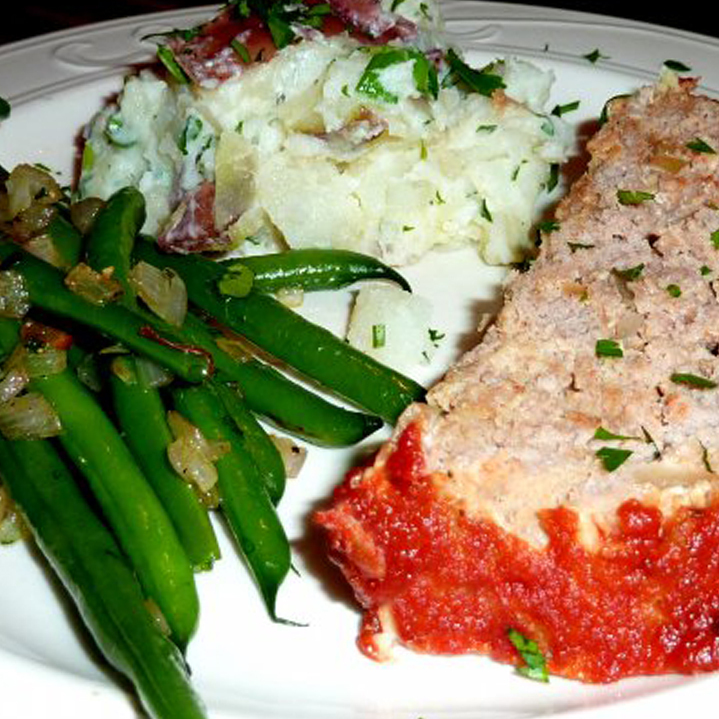 Recipe notes: This recipe uses olive oil as the base for the “sauce”. It is surprising in that it is not dripping in fat or greasy tasting. The idea is to coat the pasta rather than drenching it in a heavy sauce. The recipe comes together very quickly so I recommend having all of your ingredients ready to go by the time the pasta is almost ready to drain. Add a tablespoon of kosher salt to a large pot of water over medium-high heat. When the water comes to a boil gently stir in the pasta. Continue stirring occasionally and cook 8 to 10 minutes or until the pasta has softened to your desired doneness. When the pasta is roughly two minutes from being done, heat the olive oil in a large sauté pan over medium high heat. When the oil is hot, stir in the garlic, thyme, red pepper flakes and about ¼ teaspoon of fresh ground black pepper. Stir constantly for about 30 seconds then add the shrimp in a single layer. Shake the pan to “nestle” the ingredients. Meanwhile, test the pasta for doneness, and drain into a colander reserving a little of the pasta water on the side. 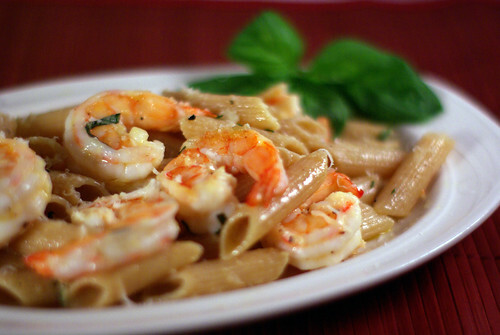 After about 2 minutes, shake the pan again to loosen any shrimp that may be sticking and turn the shrimp over. Cook 2 minutes more on the second side then add the lemon juice and a couple of tablespoons of the pasta water. Cook another minute and remove the pan from the heat. To finish, stir in the pasta and the basil, gently tossing to combine. Serve with fresh grated parmesan sprinkled over the pasta. Making the salmon cakes last week brought another old favorite to mind, Turkey Croquettes. The original recipe called for making the gravy with cream of celery soup and although I was tempted I opted for cleaning this one up a little bit and making it fresh. The recipe looks involved but I would honestly consider it intermediate to easy. That reminds me that I have been meaning to mention one of my favorite kitchen tips. Kitchen Tips: To boost your confidence a little it is always a good idea to read a recipe through start to finish at least once if not twice before you begin preparing it. Speaking of cleaning it up a friend mentioned possibly converting this recipe into an Atkins Diet version and I think it would be fairly easy to do. For a lower carb gravy you could 1) use almond flour instead of whole wheat flour or 2) eliminate the flour altogether and simply thicken the gravy by boiling it a little longer and allowing the broth time to reduce. For the croquettes my first thought was simply to eliminate the bread crumbs but that might result in too dense of a croquette. One of the things I really like about this recipe is the lightness of the final product so I think I would prefer to use a cup pork rind crumbs instead of completely doing away with the filler. I know that may sound like an odd substitution but I have tried it in other (low carb) recipes and it works quite well for this type of diet. Notes: The easiest way that I have found to form these croquettes is to use the lid from a Ball mason jar as a ring mold. To do this, simply set the removable “top” of the mason jar lid aside and lay a sheet of plastic wrap over the ring shaped threaded part of the lid. Now, with the lid sitting top-down on a flat surface use a wooden spoon to press in just enough of the turkey mixture to fill the lid completely, flatten and level off the top, then turn the lid over to gently pop out your formed patty. Heat 1 tablespoon of olive oil in a large sauté pan over medium heat until shimmering. Sauté the onion, celery, and carrot for two minutes then add the tarragon, sage, and 1/2 teaspoon each of kosher salt and fresh ground black pepper. Continue cooking stirring occasionally until the onions begin to turn translucent then stir in the tomato paste and Worcestershire sauce and cook 2 minutes more. Stir in ½ cup of chicken stock and allow the mixture to cook until most of the moisture has evaporated, about 5 minutes. Add the second ½ cup of chicken stock and the minced garlic, allow the mixture to come back to a boil then remove the pan from the heat and set aside to cool for at least 5 minutes. In a large mixing bowl gently break apart the ground turkey then fold in the bread crumbs, egg, and the onion mixture. Gently fold the mixture until all the ingredients are incorporated but not over-mixed. Form the mixture into 10 to 12 equally sized patties and placing them on a foil or wax paper lined cookie sheet as you go. Place the cookie sheet in the freezer for at least 10 – 15 minutes to firm up the patties before browning. In the same pan, add 2 tablespoons of olive oil and warm over medium heat until the oil is shimmering hot. Swirl the pan to evenly distribute the oil then gently place half of the patties (do not crowd) in the pan. Shake the pan a little to prevent sticking and brown 3 to 4 minutes on each side. When the patties are browned remove them from the pan and place on a cooling rack or paper towel to hold. Wipe the pan and repeat this process until all of the patties are browned. Do not wipe the pan after the last batch saving the oil and browned bits for the gravy. 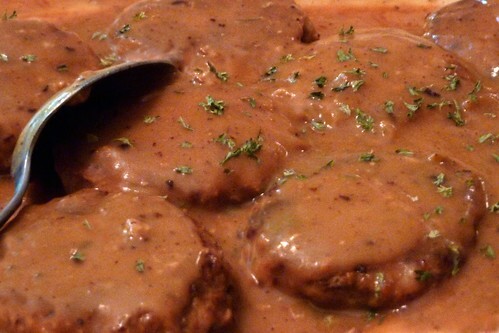 After the last batch of patties are browned and removed from the pan add two tablespoons of whole wheat flour to the pan and stir to create a roux. There should be just enough oil and flour to create a smooth, almost liquid, paste; add a little more olive oil if the roux seems too dry. Cook, stirring until the flour begins to take on some color, about 5 minutes, then whisk in 1 cup of the broth. When the first cup of broth is incorporated, whisk in the second cup of broth and continue whisking slowly until the gravy begins to boil. Lower the heat to a simmer and check the gravy for seasoning. Add kosher salt & fresh ground pepper if needed. Return the croquettes to the pan coating each one with the gravy, then simmer 10 minutes more. 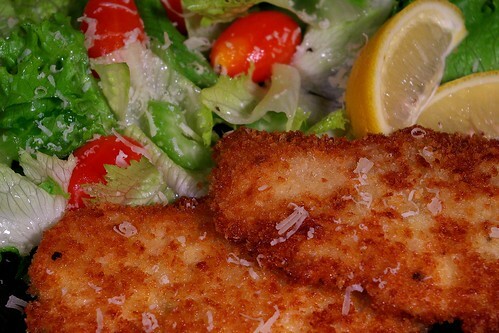 Serve croquettes over rice, egg noodles, or toast points as desired. 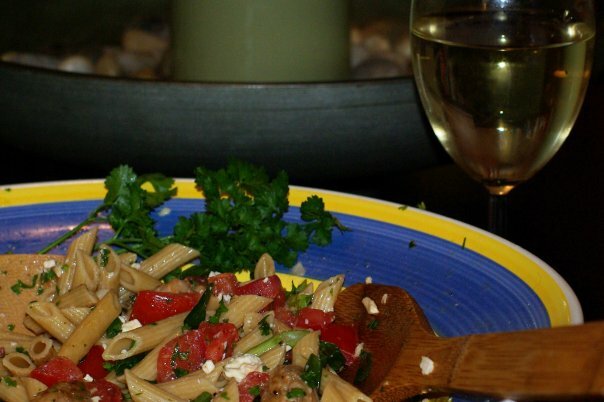 For a weeknight dinner that is super easy to prepare try this Penne with Fresh Tomatoes, Feta, and Herbs. Want to mix things up a bit? Replace the sausage with bite sized cubes of cooked chicken or turkey breast, use whole grape tomatoes instead of chopped, or add capers and chopped green & black olives for a real Mediterranean twist. This pasta is great served with salad and a hunk of crusty whole wheat baguette and makes more than enough for lunches the next day. Mix first 8 ingredients in a large pasta bowl. Set mixture aside. Cook pasta in large pot of boiling salted water until just tender but still firm to bite, stirring occasionally. Drain. Add hot pasta to tomato mixture and gently toss to coat. Add Olive Oil, Season to taste with salt and freshly ground black pepper and gently toss. Frittatas are another very versatile and fast way to whip up a great dinner. This one calls for Spinach and Tomato but, like pizza, the ingredient list is limited only by your imagination. Some of our favorite combinations include tuna & scallions, diced ham & fontina with scallions, and asparagus, artichoke hearts, tomato, & onion. Fresh grated Parmesan cheese is a constant for me and I even sprinkle some over the top for an added flavor boost. Though I used Soy Milk in this recipe you can use skim milk, whole milk, or even half & half in yours. Get creative and have a little fun! Heat 1 tbs of the olive oil in a 10 inch non-stick pan over medium heat. When the oil is beginning to shimmer, add the leeks and about 1/4 tsp fresh ground pepper. Cook, stirring often, 2 to 3 minutes until the leeks are just transparent. Remove them to a bowl to cool. Using the same pan, raise the heat to med high and bring 1/4 cup of water to a boil. Dissolve about 1 tbs of kosher salt, then carefully add the spinach. Cook 2 to 3 minutes until spinach is wilted then pour into a colander to drain and cool. When the spinach is cool enough to handle, in a dishtowel, gently squeeze out excess water. Hold the spinach in the same bowl with the leeks until ready to use. In a large bowl beat the eggs with the soy milk. Gently fold in the flour and the nutmeg, then the spinach, leeks, diced tomatoes, ricotta, and most of the Parmesan cheese, reserving about 1 tbs. Warm the same pan over med heat with 1 tbs of olive oil. Meanwhile carefully distribute the potato slices evenly around the pan trying not to overlap. When the potatoes begin to sizzle, pour the egg mixture into the pan. Use a spoon to make sure the ingredients are evenly distributed. Lower your heat to low, cover the pan and cook for about 10 minutes or until the eggs have begun to set and pull away from the side of the pan. Remove the cover and evenly distribute the tomato slices around the top, sprinkle with the reserved Parmesan then carefully place the pan in the oven. Bake uncovered for about 20 minutes or until the eggs in the top center appear to be completely set. Remove the pan from the oven and using a thin spatula carefully loosen the frittata from the pan all the way around the edges. 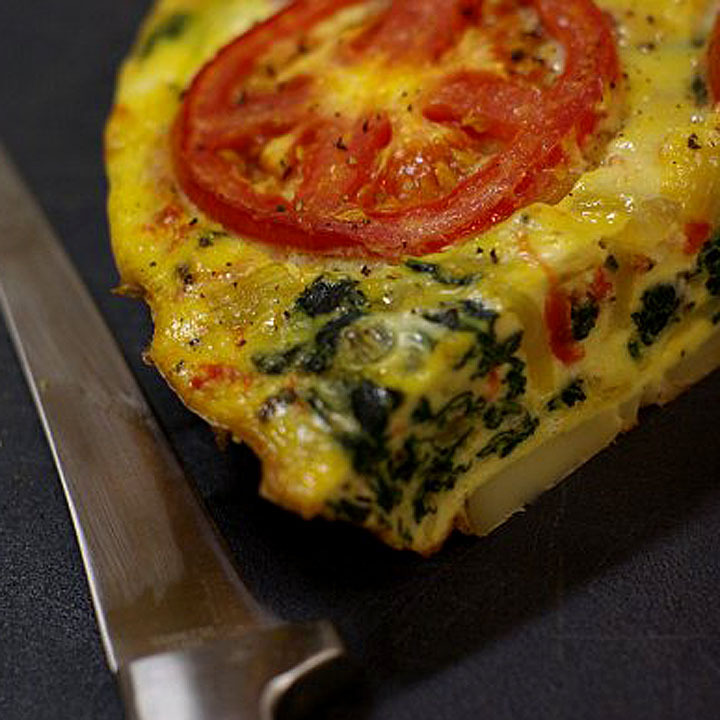 When the frittata is freed from the pan, gently slip it out of the pan and onto a cutting board to rest. Rest 10 minutes, then slice into pie shaped pieces to serve. * Note: Tomatoes are easy to peel if you blanch them in a little hot water for a minute or two. For this recipe, slice about a 1/2 inch “X” in the bottom of your tomatoes (opposite the stem end). Gently drop them into a pan of water heated to near boiling and simmer for two minutes or so until the tomato skin at the “X” begins to pull away. Now removes the tomatoes and cover them in cold water to stop the cooking. Once the tomatoes have cooled the skin will be very easy to peel; I use the edge of a knife to grab it and gently peel it away. To remove the seeds, cut the tomato in half cross ways (midway between the stem and the bottom) and gently squeeze the tomato to force out the seeds using the tip of your knife to remove any stragglers.